Buddhism has remained the most influential religion in the life of Guangzhou people as well as those of China. There are many Buddhist temples in the city, and the Temple of Six Banyan Trees is one of them. This Buddhist temple is about 1,400 years old, and has witnessed a lot of ups and downs of the Chinese history. It is situated at the Liurong Road. Coincidentally enough, the literal meaning of this road refers to the road on which the six banyan trees are located. The Temple of Six Banyan Trees was not always known by this name. In fact, like the structure itself, its name has also gone through several changes. The current name popped up during the reign of the Song Dynasty. In the beginning, the temple was known as Changshou Temple or the Longevity Temple, which was later changed into Jingshui Temple, before finally getting its current name. The present name of the temple was suggested by Su Dongpo, a well known litterateur. He found the presence of six banyan trees in the temple compound quite soothing and cheerful. 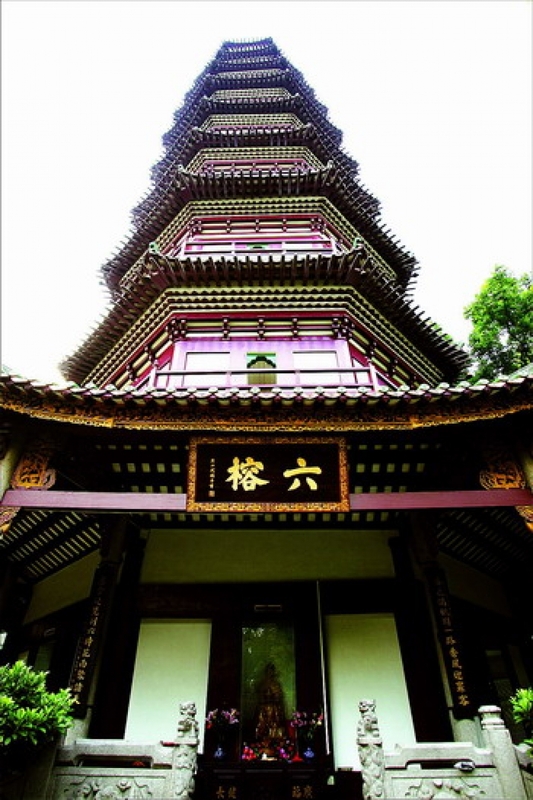 Considered to be one of the oldest Guangzhou attractions, the temple was built in the year 537 AD and currently houses various relics that refer to the rich culture of ancient China. You will find a pagoda located in the temple's middle part. The pagoda is known as the Six Banyan Pagoda or the Flowery Pagoda, and is about 57 meters tall. On the left of the pagoda, you will find ten tablets, one of which narrates the history of the structure. You will also find an image of Su Dongpo in one of the tablets. There is also a bronze sculpture of Hui Neng. The main hall of the temple is known as Daxiong Baodian Hall and has three famous statues, namely Amitabha, Sakyamuni, and Apothecary Buddha. The symbolic meaning of these statues is that they denote past, present, and future respectively. You can burn incenses and make a wish before these statues. The most amazing thing of this pagoda is that you cannot properly have an idea by just looking at it from the outside. When looked from the outside, though the pagoda seems like only a 9 storeyed structure, it actually has 17 storeys. Once you go to the top level of the pagoda, you will find a bronze column that has about 1000 figures of Buddha. The pagoda has a very ornate design, which justifies its name. The other halls of the temple include the Tianwang Hall and the Weituo Hall. In the former room, you will see a statue of the Laughing Buddha. The latter is erected in the memory of a Chinese general named Weituo, whose figurine is also present in the hall. According to popular beliefs, the general had recovered many art Buddhist relics and valuables from thieves. The best time to visit the temple is during the Chinese Spring Festival and Lantern Festival. The temple remains open from 8:30 am to 5 pm. Since it will take you a full day to explore the temple in detail, you should plan accordingly. Your visit to the Temple Six Banyan Trees will help you understand the importance and influence of Buddhism in the Chinese life.